Lincoln was the first president assassinated in U.S. history. United State President Abraham Lincoln was assassinate on Good Friday 14 April 1865. When he was attending the play "OUR AMERICAN COUSIN". 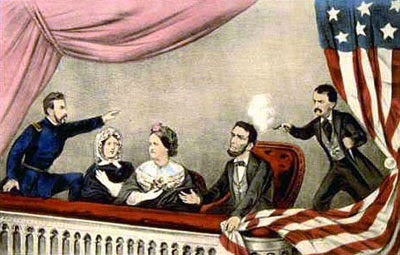 John Wilkes Booth, a famous actor and Confederate sympathizer, fatally shot President Abraham Lincoln at a play at Ford’s Theatre in Washington, D.C. The attack came only five days after Confederate General Robert E. Lee surrendered his massive army at Appomattox Court House, Virginia, effectively ending the American Civil War. John Wilkes Booth, born May 10, 1838, was an actor who performed throughout the country in many plays. He was the lead in some of William Shakespeare's most famous works. Additionally, he was a racist and Southern sympathizer during the Civil War. He hated Abraham Lincoln who represented everything Booth was against. Booth blamed Lincoln for all the South's ills. He wanted revenge. In late summer of 1864 Booth began developing plans to kidnap Lincoln, take him to Richmond (the Confederate capital), and hold him in return for Confederate prisoners of war. 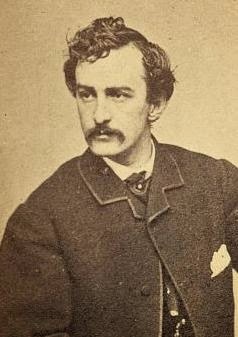 By January, 1865, Booth had organized a group of co-conspirators that included Samuel Arnold, Michael O'Laughlen, John Surratt, Lewis Powell (alias Paine or Payne), George Atzerodt, and David Herold. Additionally, Booth met with Dr. Samuel Mudd both in Maryland (where Mudd lived) and Washington, and he began using Mary Surratt's boardinghouse to meet with his co-conspirators. 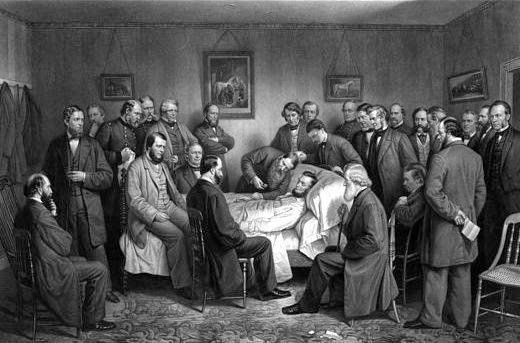 On March 17, 1865, the group planned to capture Lincoln who was scheduled to attend a play at a hospital located on the outskirts of Washington. However, the president changed plans and remained in the capital. Thus, Booth's plot to kidnap Lincoln failed. On April 9, 1865, General Robert E. Lee surrendered to General Ulysses S. Grant at Appomattox. Two days later Lincoln spoke from the White House to a crowd gathered outside. Booth was present as Lincoln suggested in his speech that voting rights be granted to certain blacks. Infuriated, Booth's plans now turned in the direction of assassination. On the morning of Friday, April 14, 1865, Booth dropped by Ford's Theatre and learned that the president and General Grant were planning to attend the evening performance of Our American Cousin. He held one final meeting with his co-conspirators. He said he would kill Lincoln at the theater (he had since learned that Grant had left town). Atzerodt was to kill Vice-President Andrew Johnson at the Kirkwood House where Johnson resided. Powell was assigned to kill Secretary of State William Seward. Herold would accompany Powell. All attacks were to take place simultaneously at approximately 10:15 P.M. that night. Booth hoped the resulting chaos and weakness in the government would lead to a comeback for the South. The presidential party arrived at Ford's at about 8:30 P.M. Armed with a single shot derringer and a hunting knife, Booth arrived at Ford's at about 9:30 P.M. Joseph Burroughs, a boy who worked at the theater, held his horse in the rear alley. Booth went next door to a saloon for a drink. He entered the front of Ford's Theatre around 10:07 P.M. Slowly he made his way toward the State Box where the Lincolns were sitting with Clara Harris and Major Henry Rathbone. Lincoln's bodyguard, John Parker of the Metropolitan Police Force, had left his post. At about 10:15 P.M. Booth opened the door to the State Box, shot Lincoln in the back of the head at near point-blank range, and struggled with Rathbone. Booth stabbed Rathbone in the arm and jumped over 11 feet to the stage below. When he hit the floor he snapped the fibula bone in his left leg just above the ankle. Many in the theater thought he yelled "Sic Semper Tyrannis" (Latin for "As Always to Tyrants"). Mrs. Lincoln screamed, Booth flashed his knife at the audience, and he made his way across the stage in front of more than 1,000 people. Everything happened so fast that no one had time to stop him. Booth went out the back door, climbed on his horse, and escaped from the city using the Navy Yard Bridge. Atzerodt made no attempt to kill Johnson, and Powell stabbed Seward but failed to kill him. Herold escaped from the capital using the same bridge as Booth. The two met in Maryland and stopped briefly around midnight at Mary Surratt's leased tavern in Surrattsville where Mrs. Surratt had earlier left the message to have weapons ready and had dropped off a wrapped package that contained Booth's field glasses. About 4:00 A.M. Booth and Herold arrived at Dr. Mudd's home where Mudd set and splinted Booth's broken leg. Back in Washington Lincoln never regained consciousness and passed away at 7:22 A.M. on the morning of April 15, 1865, at thePetersen House (across the street from the theater). Booth and Herold departed from Dr. Mudd's during the afternoon of April 15 and traveled south. Federal authorities caught up with them at Garrett's farm near Port Royal, Virginia, early in the morning of April 26. Hiding in a barn, Harold gave up. Booth refused, so the barn was set on fire. Booth still didn't come out and was shot to death by Sergeant Boston Corbett. Corbett had not been under orders to do this but felt other soldiers might be shot by Booth. Booth's body was searched, and a diary was among the things found. Booth's remains were returned to Washington where positive identification was made and an autopsy performed. Within days the government arrested Booth's co-conspirators (except John Surratt). A military tribunal tried them, and all were found guilty. Mrs. Surratt, Powell, Atzerodt, and Herold were all hanged on July 7, 1865. Dr. Mudd, O'Laughlen, and Arnold were given life terms in prison. Edman "Ned" Spangler, a Ford's stagehand who was convicted of helping Booth escape from the theater, received a sentence of six years in prison. The convictions of Mary Surratt and Dr. Mudd have been hotly debated throughout the years. John Surratt escaped to Canada and then to Europe. He was captured abroad and was tried in 1867 in a civil court. The trial ended with a deadlocked jury, and Surratt went free. O'Laughlen died in prison (Ft. Jefferson in the Dry Tortugas near Key West) in 1867. President Andrew Johnson pardoned Dr. Mudd, Arnold, and Spangler early in 1869.